Looking to grab a quick cup of coffee on the go? The next time you find it difficult to spot a coffee-shop, look around for the Velopresso. 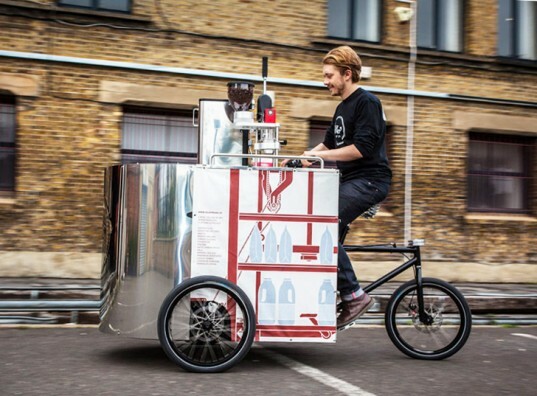 A coffee-store-on-wheels, this one was designed by Royal College of Art graduates Amos Field Reid and Lasse Oiva. In essence a pedal-powered cart, the Velopresso uses an old tricycle frame while the gears are alternatively used to propel the cart or work the coffee grinder! Using a small gas canister to boil water when needed, the Velopresso works as a low-carbon and low-energy business solution. Also, the designer duo is working on a system to recycle the coffee grinds into ethanol, which in turn could be used to create energy!